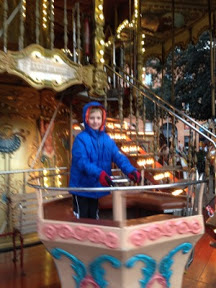 Toulouse city has a lovely christmas market which we have been intending on taking the children into for a while now. Due to the fact it has either been too cold, or James has been working we had not managed to find the time till yesterday. Despite the fact that it had been -5 overnight and the sun only started to peek through the clouds at about 1pm we decided that as the kids only had half a day of school and James was quiet at work we'd head in. 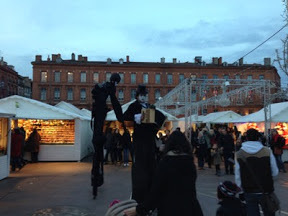 The timing was a bit of a balance as we wanted to miss the horrendous Toulouse traffic but be in town as it got dark so we could see the lights. We headed in about 4pm and had a good run in on the road. 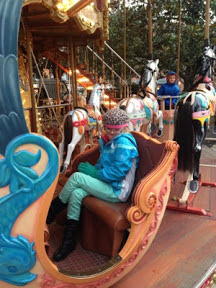 We parked then wandered up through place Wilson where the children had to have the customary carousel ride. 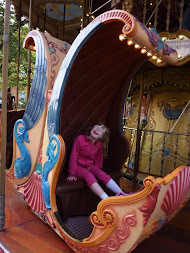 Hannah always goes for the seashell and Penelope got to choose a pony on the second story while jasper made himself dizzy in the spinning cup! 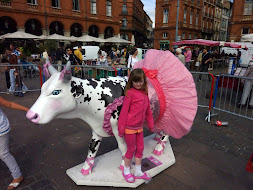 We walked through the busy city to the capitole where the market was. The market stalls were set up in little huts and there was everything from jewellery to soft toys and lots of different types of food. We found the mulled wine stall so James and I got a cup each. 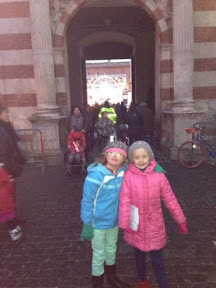 We then wandered around and took a photo with a blow up Santa and were entertained by a fire juggler and stilt walkers. It was a lovely market all very Christmassy with the stalls selling a range of traditional French ware. We had thought we might be able to have dinner from the stalls but there wasn't a huge range of gluten free things on offer but James found a stall selling aligot which is mashed potato with cheese, butter and salt and pepper. It was very yummy and we all had a taste of that. In the square of the town hall looking out to Capitole square. 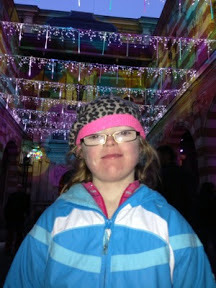 Gorgeous Hannah with the twinkling lights. 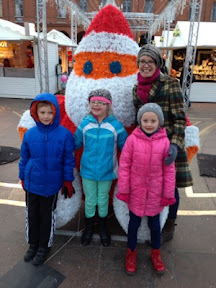 It was starting to get cold so we headed into a toy store to do some christmas shopping. The children all bought their gifts for each other so that was good to get that done. 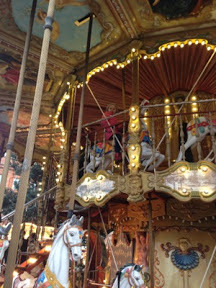 We then headed into the streets of Toulouse to marvel at the lights. 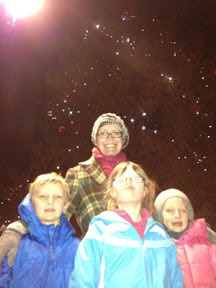 The plus side of it being winter at Christmas time is that it gets dark early so it is easy to take the kids to see the christmas lights. Toulouse has a very low skyline with no buildings over about eight stories and most only about two or three stories so we decided to head up to the top of the department store galleria lafayette to get a view of the lights. It was very pretty although probably better in the day time when you get a good view of all the roof tops - just like in the kids movie ratatouille . A view over the rooftops. As the kids were still hungry we decided to have dinner at flunch which the kids loved and was great value for money. Under the Christmas tree in Place Wilson.